Let's have a little conversation here about BRANDING. This is going to be done through your website and if you approach this as a "business" (which it is) from the very outset, then you are going to be aligning yourself for long term, sustainable success online. To discover your brand, you need to first decide on your "target audience" for your website. This is a GOOD thing. This means that the opportunity to promote WA and become wildly successful promoting Wealthy Affiliate is vast. There truly are many different facets to the platform here at Wealthy Affiliate and as you immerse yourself here, you will truly realize how BIG the opportunity is to benefit from WA. Whether your target audience is "affiliate marketing" or "earning extra money while in college" or "stay at home moms", you can choose your own brand and niche to carve out and build a long term business within. EVERYONE can benefit from the platform here at WA, it is just a matter of finding these people and connecting with them. There you are, standing in a football stadium. 80,000+ wild fans, all of whom are passionate about something and have spent $100's on their ticket, not to mention transportation, food, and likely a beer or two at the game. The average sporting event costs a family $421 USD. These people all have money and these people could ALL benefit from Wealthy Affiliate, if they knew about it and knew that they could take any passion or interest and build a business online. Go into a big city, and look around. You will see the same thing. EVERYONE is a potential referral, everyone can benefit from WA, and all of these people would love nothing more than to have their own business online. In fact, I am sure you can quite easily put yourself in these people's shoes. These are obviously just a few examples of how big the audience is. You can have a very SMALL fragment of attention on the Internet, and be very successful as an affiliate here. There are 3.75 BILLION people online, all of whom could benefit from the services here at Wealthy Affiliate to create, grow and expand a business online. Now it is just a matter of narrowing down your audience and finding them. You have chosen your starting point niche and the "traffic" (audience) is something that I am going to be helping you out with as you move through the training. You Are a BRAND, You Will Be An Expert. One thing I want you to understand is that the minute you start building out your website, you are building a brand. You are working to become a SOURCE of information online and through time and effort, you are going to become an industry expert. But nobody starts off as an expert with anything they do in business. Regardless of the niche you choose online, you need a starting point and then through TIME and through helping people, you gain credibility and trust within that particular industry. The same goes for this industry and being an affiliate of Wealthy Affiliate. You don't start off at the end point in business, you start off in the beginning and ALL top affiliates at one point started out as complete newbies. Many of these same folks are sitting with us in Vegas every year at our annual Super Affiliate Conference (all expenses paid). Your task today is going to be choosing your target audience, or in other words, the "direction" of your brand/niche. Again, you are in full control of this and there is no right or wrong, but the important thing is that you choose a direction that interests you. I want to help aspiring and successful affiliate marketers, and as I build out my website and my brand, that is going to be the core theme of the topics I am discussing. I like it, it is cool, hip and I think something that I can work myself into as a brand. So what you are going to need to do is choose your direction, because in the next lesson I am going to be walking you through the process of building a website geared towards your brand. If you need help coming up with your "direction", simply leave a comment below. 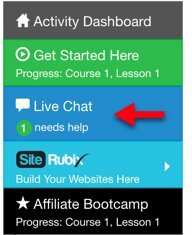 The comment area or Live Chat (within the side menu) is where you can get HELP at any time, please take advantage of it. You have an incredible amount of help here within the community and we can absolutely help you refine your ideas or give you a "yay" or "nay" if you want feedback or help you with any aspect of your campaigns.